Everyone likes their food a different way. Some people enjoy the comfort of simple, homemade foods that they know the exact taste of while others seek the thrill of creating and trying new and exotic foods. Holly Huellemeier, current FABE graduate student, falls into the second category. From Georgetown, Kentucky, Holly has always loved cooking. When she’s in the kitchen, she’s constantly exploring her options and finding out new recipes and ingredients from outside the box. “I think food is such a powerful part of our world—it provides subsistence/nutrition, yet it is also a vehicle for communication and culture,” says Holly. Being the food connoisseur and mathematician that she is, she mashed her interests and found THE perfect recipe for her success: food engineering. She likes formal approaches to solving problems and what better types of problems to solve than food ones! She started her combined BS and PhD program in the spring 2018 and is currently a first year PhD student studying under Dr. Dennis Heldman. Why would she want to go to school for even longer? Because she wants to learn more. Her plan in the future is to eventually conduct engineering research and development for large scope companies. Just because she’s fused two of her passions into her academics doesn’t mean she’s short on time for her other hobbies. You can find her either playing pick-up basketball at the ARC on campus or walking her brand-new cat, Solomon, outside the classroom. 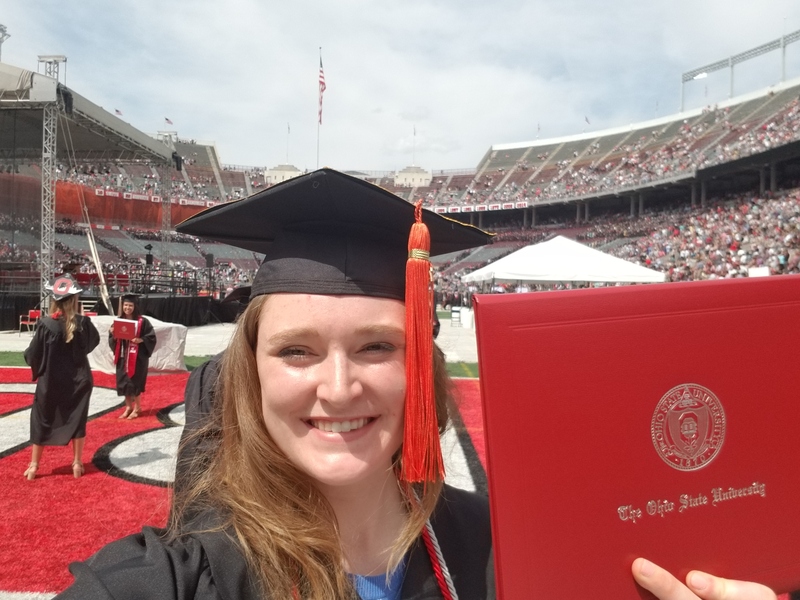 Holly is also heavily involved with her church, Fishinger and Kenny Church of Christ, and its college ministry, Buckeyes for Christ.